More information can be found in the SEModifications section of the README. 2011-09-17: Username autocomplete in comments is now a native feature. As it's currently only available on Meta, the userscript has been updated to check if the feature is enabled on the current site and will disable the userscript support if it is. Once the feature is deployed network-wide, the userscript will be updated to remove that code completely. 2012-07-23: Updates to the share link on posts broke the script, please update to the latest version to resolve the issue. The script should work under all major userscript-supporting browsers, though the autocomplete is designed with Firefox and Chrome in mind. Please file a bug if you encounter any issues. Rebecca Chernoff *, Yi Jiang, and Tim Stone actively maintain this script. The comment linking isn't working for answers. I suspect that the new answer link format is throwing it out. 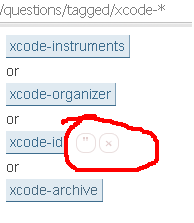 (prompted by this question), which resulted in xcode-instruments, xcode-organizer, xcode-id, and xcode-archive. While clicking through these tags (and checking whether the hover tooltip would tell me the number of questions with the tag, it didn't, call that a [meta-tag:feature-request]) to check the distribution, I found a tool whcih seems to be generated by this script. Note the vaporous and ephemeral little red circles. These appear when you mouse over the tag (bringing up the tag subscribers tooltip, which annoyingly hangs off the right side of the page) and then slide the mouse off the right side. They disappear after a few seconds; it was hard to get the above screenshot. The tooltip for the " button says "change into search term". Clicking it sends me to https://stackoverflow.com/search?q=, which could be accomplished instead by clicking on the page, which seems like a rather useless feature. The UI is difficult to use. The "change into search term" feature is unnecessary; just click the tag. The "remove from search" could be useful, but currently doesn't work. I suggest removing the 'appear on hover' functionality, the "change into search term" functionality and replacing the transient and inconsistently-styled remove button with a permanent tag/comment delete button from http://sstatic.net/stackoverflow/img/sprites.png. Would it make more sense to just drop these links on to a new line consistently?